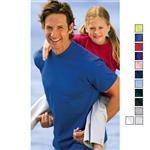 These are not your typical t-shirts - soft and with a full color imprint seam to seam. This is not your typical ink - it is infused into the tees making it soft as fabric to the touch. Ultra soft and comfortable, the Bodie is an essential tee for any corporate, food services, team and school. The Bodie Short Sleeve Tee features a rib crew neck collar with chain stitch detail. 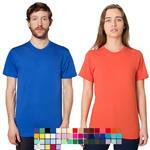 Available in 8 trendy colors, this tee will enhance your brand. Decorate with the new inFusion decoration for maximum brand exposure from seam to seam. Comfortable, full color, a beautiful look! What else do you need in a custom full color t-shirt! Available Colors: White, Red Team Heather, Sky Blue Heather, Royal Blue Heather, Purple Heather, Kelly Green Heather, Medium Heather Gray, Charcoal.